For some guidance and inspiration and by way of explanation we at TaraCelebrations offer you the following eclectic mix of how we do what we do and cover some basics so that you might reference this and use it as a starting point for being actively engaged in the cosmic cycles. We create a contemporary ritual for each of the eight festivals drawing from the ancient traditions, mythology and beliefs found predominantly in Ireland. Some meets are more like social gatherings whilst others are formal and ceremonial /ritualistic depending on the prevalent energies of the time and place as interpreted by the day's host. Everything we do is for the highest good of all. We are spiritual beings with an earth experience. As such, part of us is in constant contact with the godhead/god/goddess/creator/divine. This is within us all and the planet. The planet is a living sentient being. Energy follows thought - or - thought is energy and where you direct your thoughts you direct your energy. It is easy to talk but language can be limiting. A rounded experience at any gathering should include physical, emotional, mental and spiritual experiences, using all the senses. If the gathering does not go according to plan we review why? what was the learning? To answer this you need to ask, who is this for? One autumn equinox, the last in the cycle of the year, we had planned a detailed ceremony and gone to a lot of trouble in planning and setting up on the Hill of Tara. 3pm came and 3pm went and it was clear that the only people coming were us two. As we felt the ceremony wanted to be done we did it according to plan, modifying what we intended because no one was there to do parts. Afterwards we scratched our heads and wondered why no one had come. It was after all a ritual of endings and sheddings. Shortly afterward the group dynamic changed and a new bunch of people found us, so by Samhain we celebrated a new beginning with our first unplanned, unscripted ceremony, and went from strength to strength. Why did we choose a specific place for a ceremony, ritual or celebration? Sometimes this is a consensus decision, sometimes it is chosen by an individual. Sometimes a site is chosen and at other times the site chooses us. Occasionally we want to work with the site, heal the site or situation or avail of healing offered by the site. Personal affinity with the place is often key and having made a choice this is often accompanied by a sense of knowing and excitement. We would always ask the genus loci or spirit of place if it would be willing to welcome us. It is the equivalent to knocking on the open door of a friend to announce our presence...... and it may be that on a rare occasion the friend shouts from the back of the house saying today does not suit. As many of our gatherings are in the open air we sometimes choose a location with shelter, such as a roofed room in an old castle or abbey, a cave, indoors, a tent, and in a forest with rain coats and brollies. Other considerations include closeness to somewhere to eat, location of nearest toilet, public or private land access which may need negotiating with the land owner, health and safety, day time or night time, slipperiness of ground, weather forecast, parking (we once parked in a station and went into a public park in the centre of Dublin! ), privacy, publicity, having permission to light a fire and never lighting a fire on the ground at an archaeological site (we would use a brazier or keep the fire bowl up off the ground). How do we start planning a gathering? As a group we would start by looking at the calendar dates of the traditional (pre)Celtic festivals and deciding to base it on the day or a day close to the official day. This decision would include, phase of moon, closeness to weekends, eclipses, linking in with timing of other local or world events. Next we have a meditation where we can all enter a space to meet the spirit of place. This is commonly imagined as a helpful person. Occasionally a figure appears that we can not talk to or understand, so we ask again for someone who can speak to us at our level of understanding. In meditation/imagination the figure may lead us on a fantastical tour and express qualities and images that when we come out of meditation will inspire us. For example, going into meditation we would ask for inspiration for Lughnasadh. What would the energy of the time like us to express, address or resolve? Firstly, in 2007 some of us wanted a website to share our experiences and knowledge gained from celebrating the main eight festivals of the year and had to find a name to do that, eventually deciding on Tara Celebrations. It is not the name of a specific organisation with a constitution or set of rules, there are no members or officials such as a Chairman or Secretary. Like any community of people, diverse in background, age and life experience, we all have something to bring to the day. We each have skills and a gathering allows us to share them. Some enjoy creating a centre which others can add to, some will sing a song, know some dance steps, understand the intracies of making a Brigid's cross, write a poem, author a ritual or cook a cake. And some will be the quiet watchers who are happy to join in whatever is offered, bringing their own joy and sacredness. The important thing is that each is empowered, each feels comfortable to let their voice be heard whatever they want to 'do'. It is often helpful on the day to ask for volunteers for certain tasks for the ceremony. Useful roles may include: lighting the central fire, calling in a direction, placing symbols of the elements in the centre. When we plan a group on an open site like Tara random people passing by can join in, and it is perhaps wise to have a dedicated contact person who will chat with the curious and give the others time to organise their thoughts and focus on their roles. A friendly face to welcome and explain to new people what is happening. In some practices these would be the door keepers. What does the Host do? In the weeks leading up to a celebration one person often feels in tune with the season and takes on the role of Host / Master of Ceremonies, overseeing the intention and focus of the gathering. We like the idea of the collective leadership but on the day the person who is MC gets to hold the reigns for the spin and may direct, and include or exclude certain activities depending on the nature of the group. They become the spokesperson for the group and provide the narration of what is going to happen, what is happening and explains, encourages, cajoles and harrangues people to action. They can be the storyteller or even introduce the storyteller. In short they are the glue in the background that keeps all the other aspects sticking together for the event. We have also found that someone else with a running order can prompt the MC. Smudging normally involves wafting scented smoke over people, places and things to allow the smoke latch onto negative energy and disperse it away. We have used sage, sancto palo, scented oils, jos sticks and sometimes even a green herb used like a brush, brushing off people. We have also on occasion used water, salt, gongs and crystal. This we do at the same time as the light and start one in one direction and the other in the other direction crossing over chaotically somewhere in between. Waiting in line to get smudged (or to choose an object, etc). This is ok with small groups but with medium to large groups, the Host should use some initiative and give several people the smudge, the crystal or whatever. Waiting breaks the energy continuity, people get restless with nothing to do, start chatting amongst themselves, become distracted, and the focus is lost. Alternatively have people contemplate as they listen to music or drumming. Why pass a light round the group? 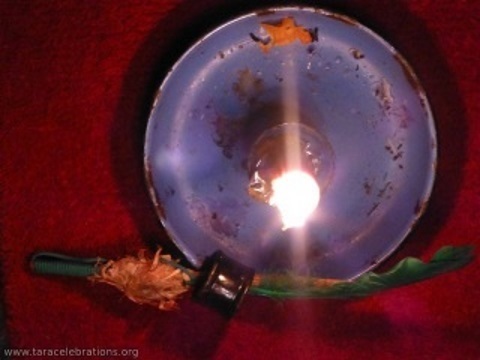 This involves looking at a candle flame to recognise the light within and without. It symbolises transformation, as the solid wax gets turned into liquid and then into a gas and energy, light (as it illuminates). Normally we get people to stand in a circle and pass the light from one to another, each taking a moment to acknowledge the light. Once we do smudge and light we have prepared a sacred space ready to contain the main ceremony. Why connect to the Directions? 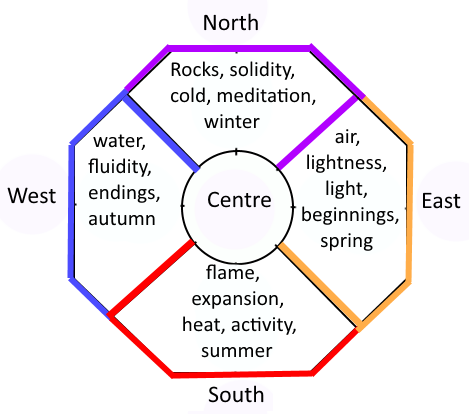 The cardinal directions act as a reminder of the different qualities of energy. From cold and harsh to warm and soft and everything in-between. There are many classifications of directions and some use seven, including above and below. But for the most part we use 5 for simplicity. Traditionally they are seen to anchor the energy so that particular qualities may be drawn upon for the ceremony. We also find it a part of centering. What Sacred Activities would be used? This can involve acting out some mythical or archetypal occurrence, dancing (we have used the ghost dance, circle dancing and free form to great effect), doing something symbolic like blessing water, creating a mandala, creating an object, (Brigit's cross, lanterns, footprints, labyrinths etc). Do you share a meditation? Meditation in a ceremony tends to be short and guided as it can be ungrounding and fraught with distractions when outdoors. What is the 'Open Heart'? We normally open the circle to 'open heart' where people may take an opportunity to share something; a thought, a poem, a song, a quotation, a reading, a flower, an object, etc. The most delightful ones I recall were two hurlers clashing their hurleys together to produce a startling ear splitting crack like thunder, a woman who simply stamped on the ground and screamed, a rendition on the tin whistle, a story. How do you finish the event? Closing Directions - This is simply an ending and an offering of thanks to the supporting energies. It makes it obvious that what we are doing is coming to an end and re-focuses the participants ready to leave the safe space we have co-created. More than likely! Before the get-together some may join together in a local cafe for a bite of lunch or tea and cake. After a sunrise gathering on Tara there is nothing better than to go into Maguire's cafe for a warm drink and breakfast. It is rooted in tradition that there will be a 'feast' on completion of the ritual or celebration. Normally we ask people to bring food to share. People often bring home made foods such as tarts, pies, apples, breads etc. One year Anne and Tom even managed to bring ice cream for everyone! The feasting, although a novelty, also serves two important functions. It assists in grounding people and it is an opportunity to chat and develop friendships and networks. The simple answer is no, just bring yourself. However, the Host may want participants to bring an item as part of individual input and they will mention it in the notice of place and date. For example, eggs at Spring Equinox, or flowers at Bealtaine. Fashion - Everyday clothes and footwear, suitable for the place, time of year and weather, are worn by everyone. Rarely do attendees wear robes or 'ceremonial' clothes, though sometimes it might be suggested you wear a particular colour in a scarf or shirt, eg. cheerful yellows / oranges for summer solstice. Food to share - always welcome, we use up a lot of energy in spiritual practice. Inspiration - Open Heart is a time in the gathering when people are invited to share anything that inspires them, relevent to the season, as described above. Torch if the event is at sunset or in the evening. Camera - though you should always ask the permission of the people present before taking photographs.